Neil Williamson, The Ephemera. Elastic Press, 2006. Pp. 217. ISBN 0-95488-126-5. £5.99. This latest collection from the growing stable of Elastic Press features sixteen impressively varied short stories, published over the last ten years in such venues as The Third Alternative, Interzone, and other small press titles. One story is previously unpublished. The literary range covered by Williamson between these covers is very wide—both in terms of genre and mood and style—but almost all of them are somewhere between good and excellent in quality. As a collection, consequently, this is far more readable cover-to-cover than most. It is fair to say that one or two of the pieces in this volume did not really work for me. ‘Well Tempered,’ for example, is the story of a precocious and difficult (though not exceptionally so) nine year-old girl, and an odd but spookily successful piano teacher who gets her under control; I feel I may have missed the point of this story. ‘Sins of the Father,’ on the other hand, is the story of a career criminal hiking through the jungles of Borneo in search of his son and in the company of an old army comrade who is a Ghurkha. There is a stolen artefact, a mysterious torus, and a group who may be aliens or a spiritual cult (or both) looking for it. The climax of the tale is marred by sentimentalism and a sense of almost sacred guilt that left this reader cold. But only two disappointing stories in a collection this size is really not bad at all. Perhaps half a dozen stories have good science-fictional themes and tone, and are all excellent examples of their genre. ‘The Euonymist,’ for example, is the story of a professional namer who travels the galaxy giving good names to newly discovered items or species, and who discovers an alien plant growing in his mother’s garden in Scotland. The story addresses the politics of naming on several levels; it is no coincidence that Scots is considered a dead language in this future universe. ‘The Bone Farmer’ is the story of a world riven by a particularly unpleasant plague; a man who somehow knows himself to be doomed flees from his terrified, isolated community with his dying daughter. They meet a man who may just be able to help them, the custodian of the bone sculptures, “witnesses”, the remains of plague victims past. In ‘The Bennie and the Bonobo’ an ambitious entrepreneur meets a time-travelling, genetically engineered Bonobo who shows him the one, rare future of the multiple possible universes in which his invention proves to be successful. ‘A Horse in a Drifting Light’ is a short, allegorical piece about a world in which we all work from home, where we are all passengers, never drivers. It is not clear why the freedom the narrator so longs for in driving can not be achieved also by walking (a more sustainable practice in this ecologically sensitive world) but the image of the chrome-skinned horse that comes to represent the artificial world is a beautiful one. A handful of stories are of a more laid-back genre, set in a world closer to our own but with speculative or supernatural elements. 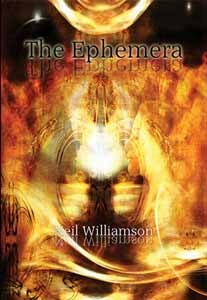 It is in these pieces that Williamson’s lightness of touch and charming writing style come across most effectively. The opening story, ‘Shine, Alone After the Setting of the Sun,’ for example, is a homely piece about a jobbing musician and her pregnant lover, an artist, who comes out of a spell of depression to create a new, almost miraculous mosaic. There is an underlying tone of tragedy throughout this moving piece, but one that constantly retains a sense of hope and optimism with the world. In ‘Cages’ we meet an old man who lives in a dilapidated high-rise with his dying canary; the image throughout is of concentric cages: the bird’s, the old man’s, the whole of our life, and the glum suspicion that even after death our souls carry on in the manner in which we lived. ‘Harrowfield,’ on the other hand, is one of the most charming, old-fashioned pieces in this collection, a story of two antiquarian book-dealers working through the private library of a recently deceased occultist. This is a ghost story with elements of tragic love, black magic, and rich characters—the most one-dimensional of which is the narrator, perhaps typical of the nineteenth century style this tale is harking back to. ‘Hard to do,’ originally published in the excellent Not One Of Us magazine, is a story which is reminiscent in some ways of the first story in the volume: a woman is at home waiting for her lover. It is clear that something is looming over her, although the reader has to gradually decide if she is dying, if the couple are falling apart, or if she is literally an ephemeral being, doomed to live only 500 days in this incarnation. One of the most harrowing, emotional pieces in the collection. The variety of pieces in this collection makes it difficult to say anything general in conclusion to a review such as this, except to remark upon the talent and versatility of the author, and hope that more from his pen comes our way soon.